This year, I’ve made my own garden planters, which left me waving my DIY gardener flag in pride. I’ve never been much of a gardener because much of what I try to grow dies. (I often joke that it’s a wonder my kids have thrived…..LOL). But I’ve become fascinated with making pretty DIY pots and planters, including those fun cedar hanging garden planters for the fence. Even if I can’t make what’s inside the garden pots and planters stay alive, I can doggone sure have fun creating decorative ways to display them until I send the plants to their untimely deaths. 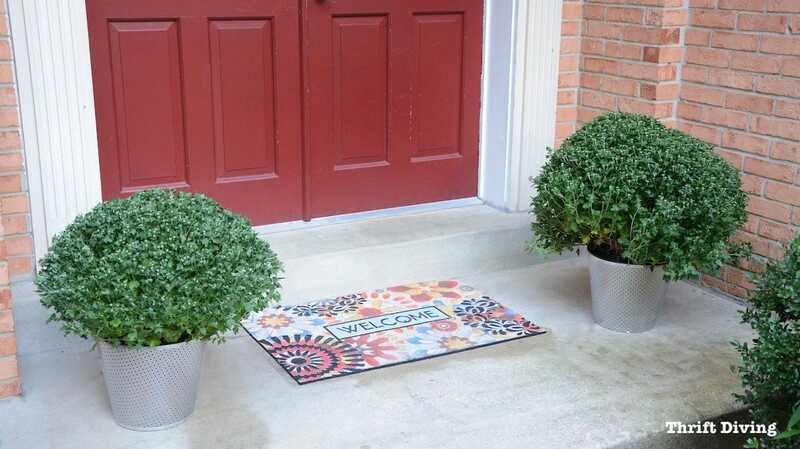 Now that fall is here, I couldn’t wait to buy some garden mums to liven up my front porch. 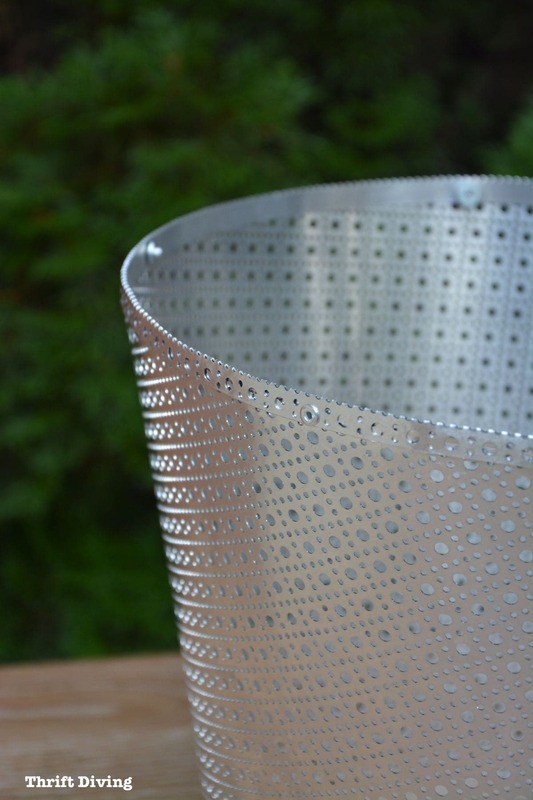 And I knew the perfect project: DIY garden planters made from decorative metal sheeting! 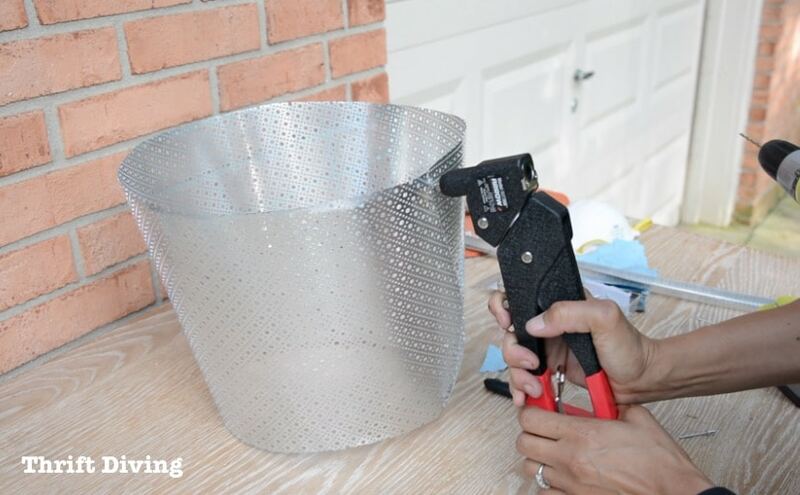 (I’ve teamed up with one of my sponsors, Arrow Fastener, to bring you this tutorial!). I actually like these original garden planters from Costco that the mums came in (only $9.99!). 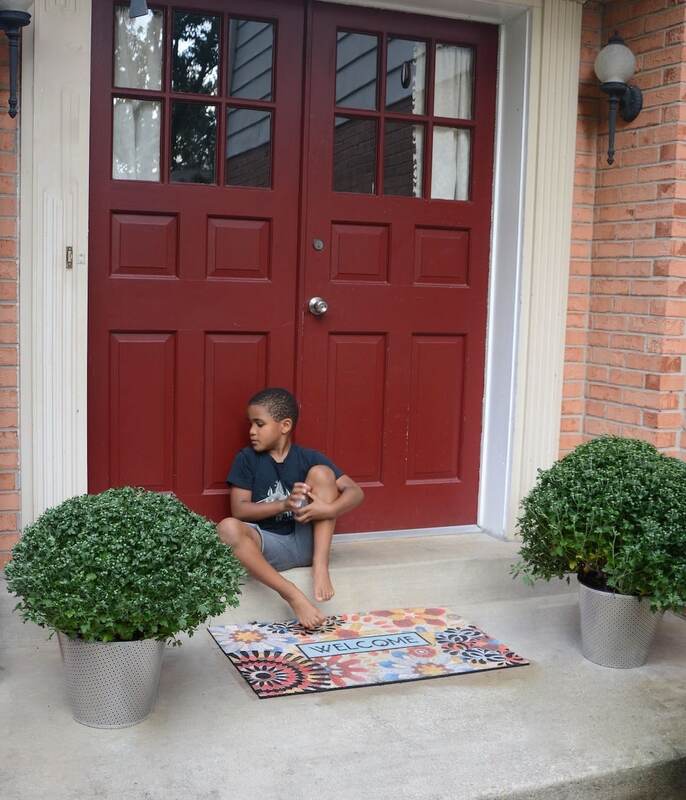 Not only is my front door red, but the brick also has reddish-orange undertones which complimented the faux wood of the planters. 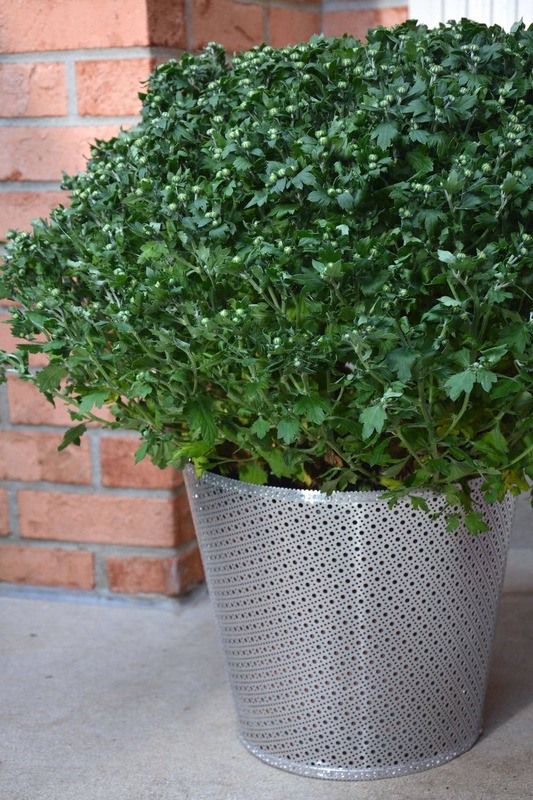 But I wanted to make my own garden decor planters out of decorative aluminum metal sheeting from the Home Depot. 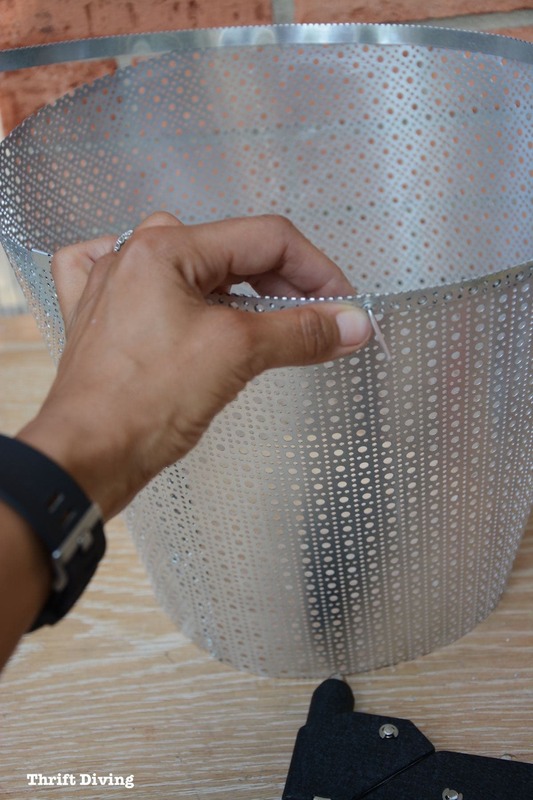 Over the summer I went to the Haven DIY bloggers conference and the company that manufactures these decorative sheets of metal had a bunch of fun crafts in their booth–everything from metal-wrapped candles, metal baskets, framed jewelry hangers–you name it. (If you’ve ever been to Home Depot, you have seen these metal sheets). Each time I pass them, I stop and rack my brain for what I could do with them. 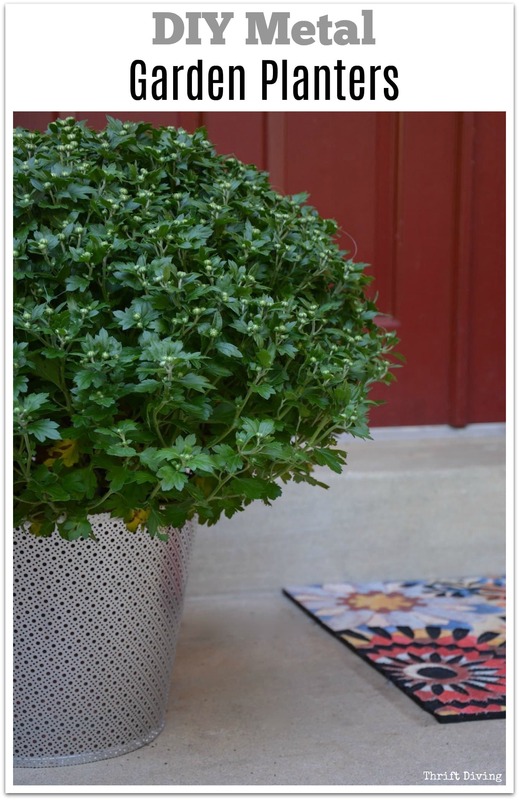 This summer, the idea came to me: decorative DIY garden planters! As I mentioned earlier, Arrow Fastener is one of my partners here at Thrift Diving. Each month they challenge me to use their hand tools that they’ve sent, incorporating them into my projects. 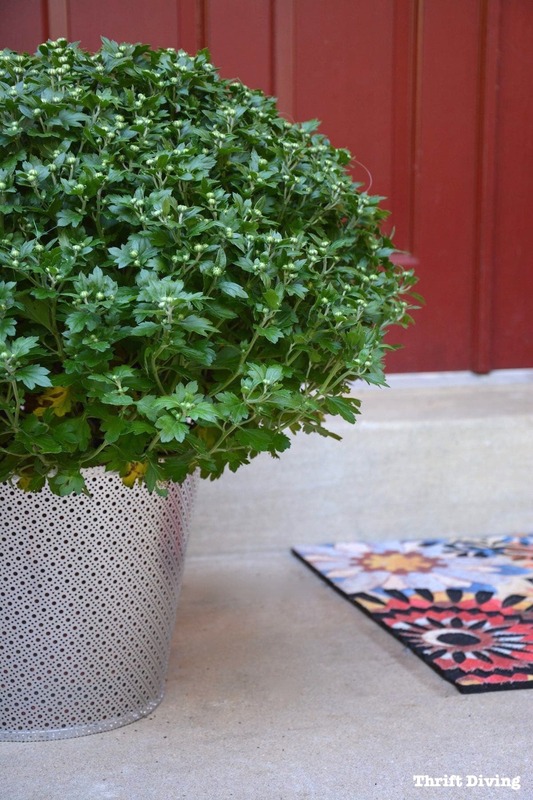 When September came around, I had planned to make the garden planters from metal using one of my favorite Arrow Fastener favorite (the riveter), but I had no idea how I was going to do that–until I put two and two together and realized–YES! 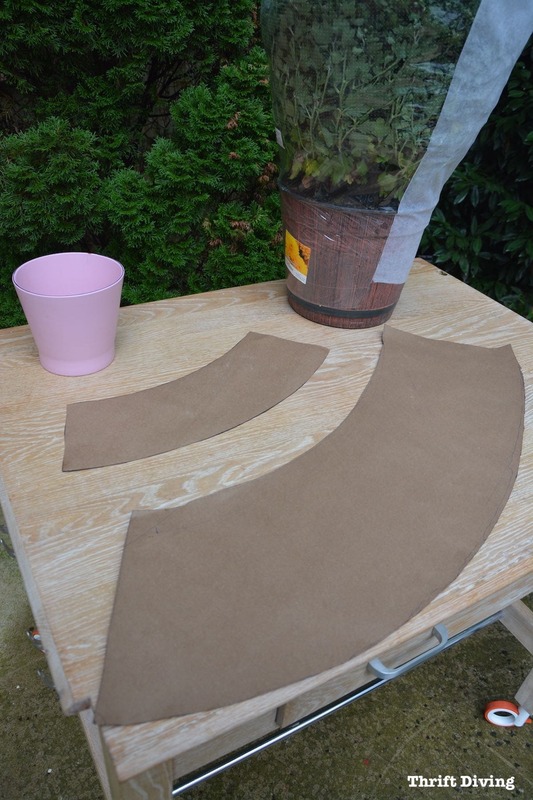 Whenever you’ve got a cylinder-shaped planter for which you want to make a decorative cover, you’ve got to first make a template of it. (The same is true for making paper covers for ugly lampshades, t00). Simply lay the garden pot down at a starting point (be sure to mark the bottom of your pot so you know where the starting mark is). 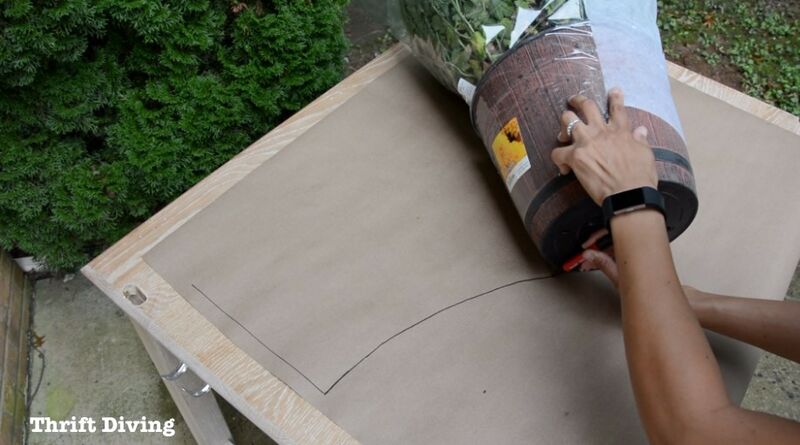 Use a marker to carefully trace along the path of the garden pot as you roll it until reaching the starting mark on the bottom of the paper. Do the same for the top of the pot. 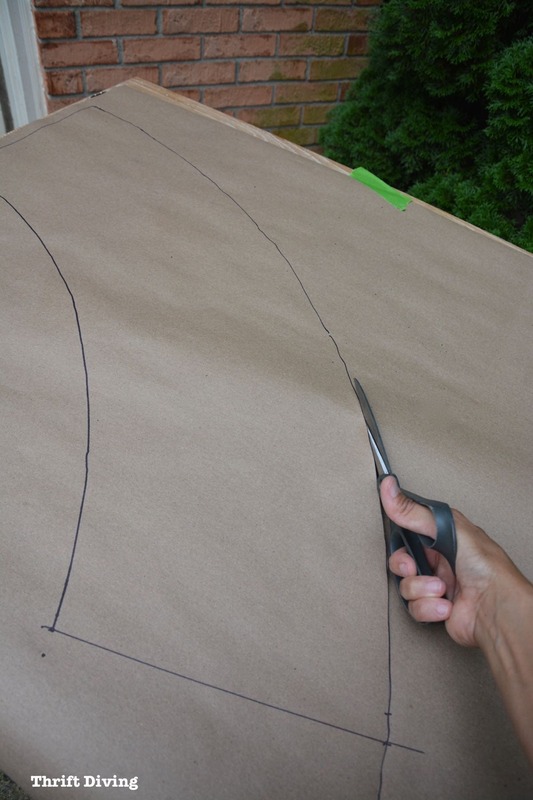 When done, you’ll have curved templates that look like this. (TIP: Smaller pots will have smaller templates; bigger pots, bigger templates. 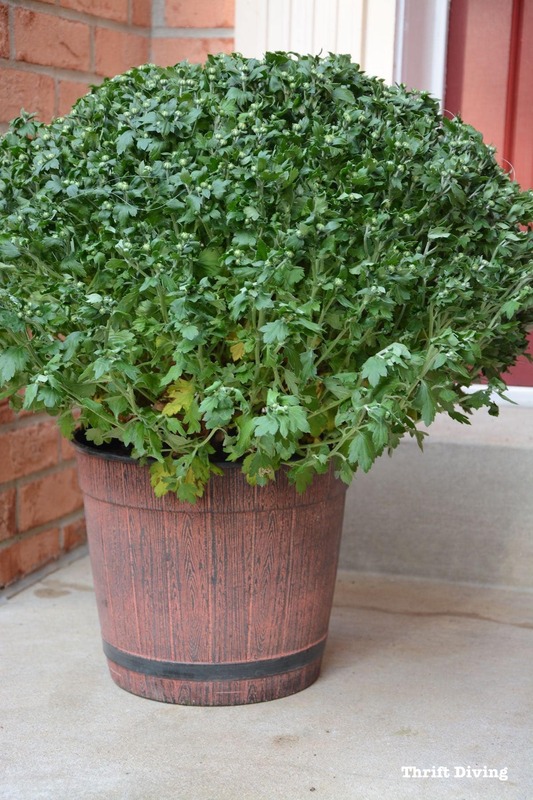 Keep that in mind when choosing materials for the decorative garden pot covers). 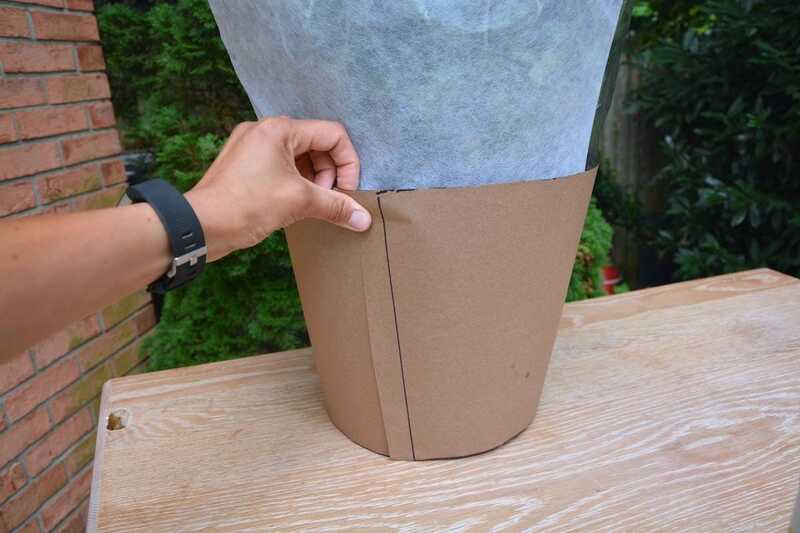 After I cut it out, I wrapped it around the garden mum pot to make sure it would fit. 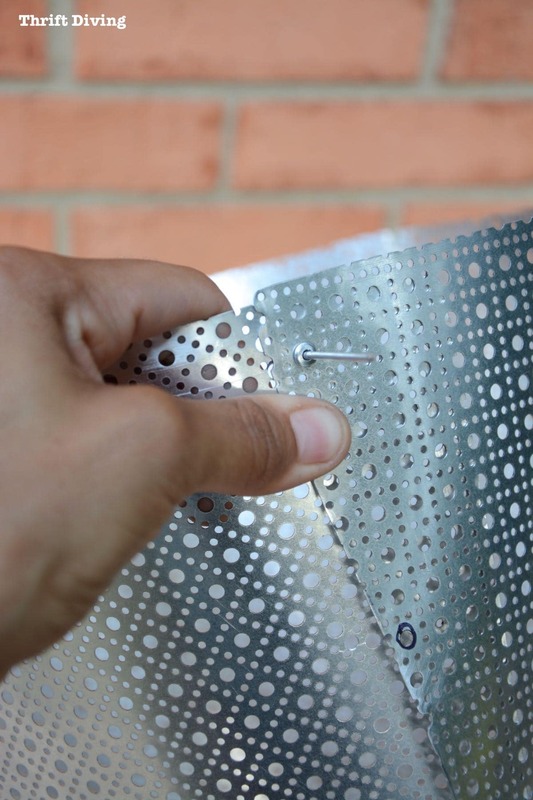 Now you’ve got to trace out the pattern on your metal sheeting. Be careful when cutting metal. That stuff gets sharp! 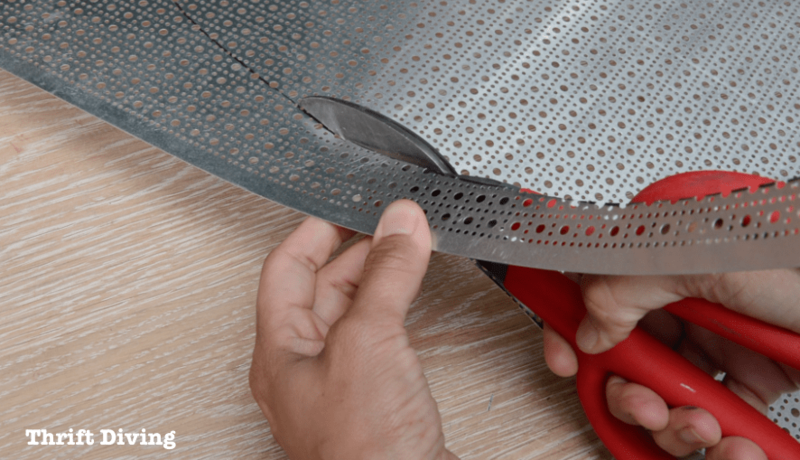 After you’ve done all the cutting, use your P220 grit sandpaper to smooth out the edges of the metal, being careful not to scratch the metal too much. 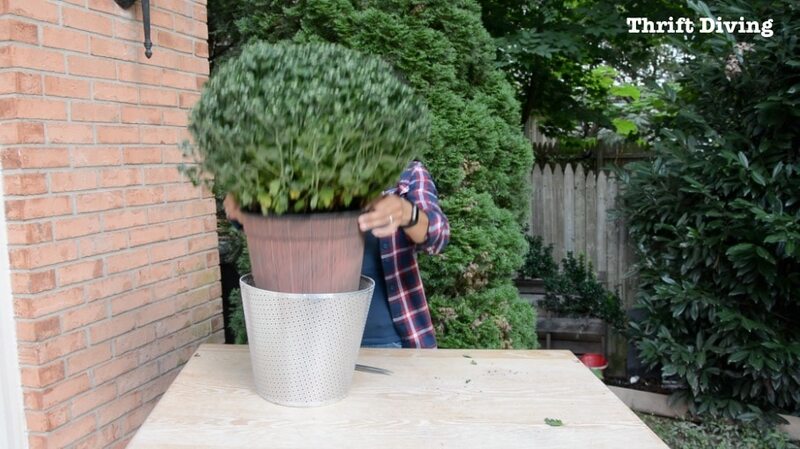 After I cut out the metal garden planter and seeing that it actually fit (YAY! No do-overs! 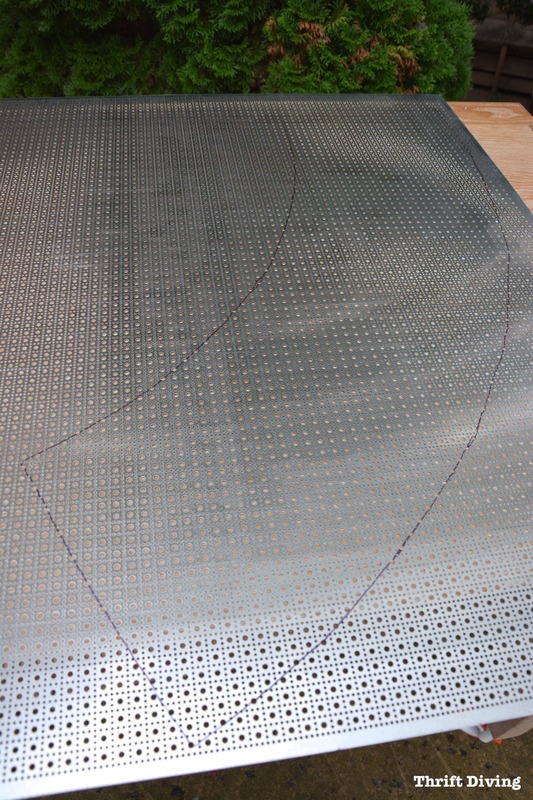 ), I marked where to insert the rivets to create the shape of the planter. 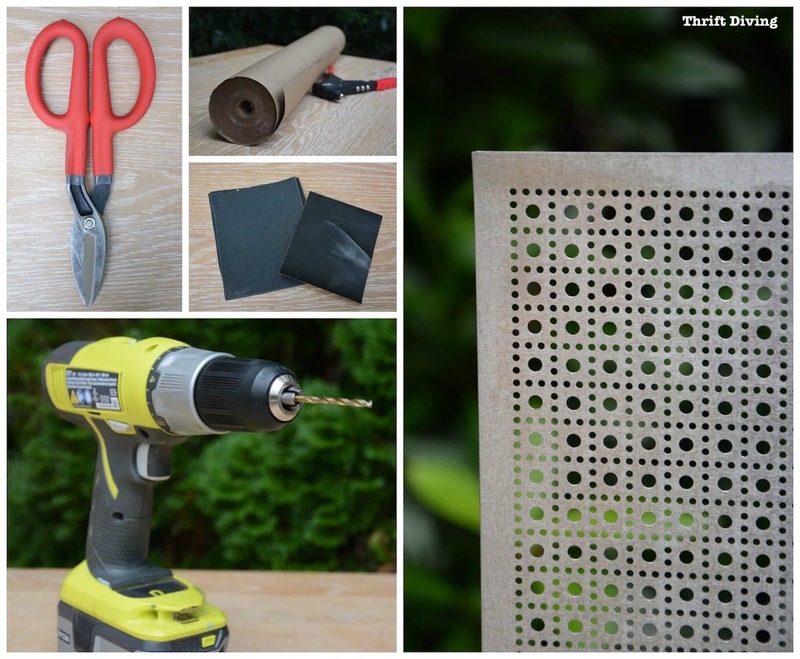 The holes won’t line up perfectly, so now is a good time to pull out the power drill and gently drill your own holes where you need. 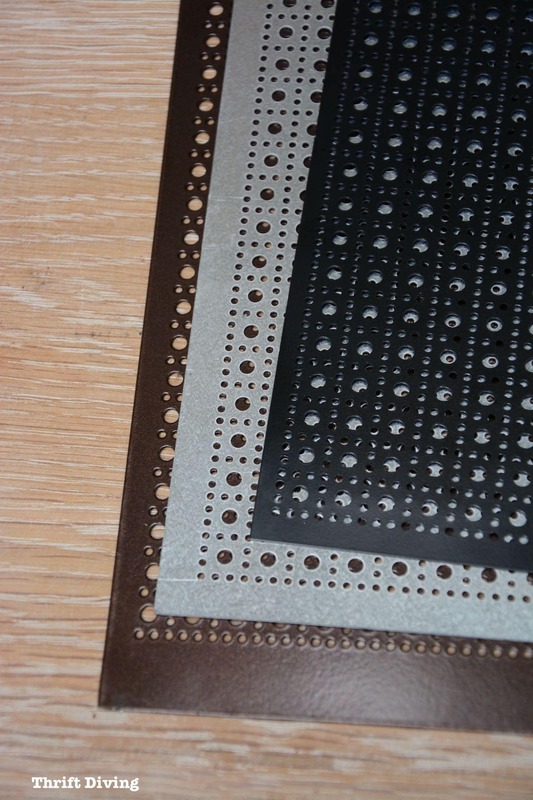 For this project, I used the short rivets that are 1/8″ thick. They were perfect for this metal! I put rivet washers on the back side to help keep the rivets in place. 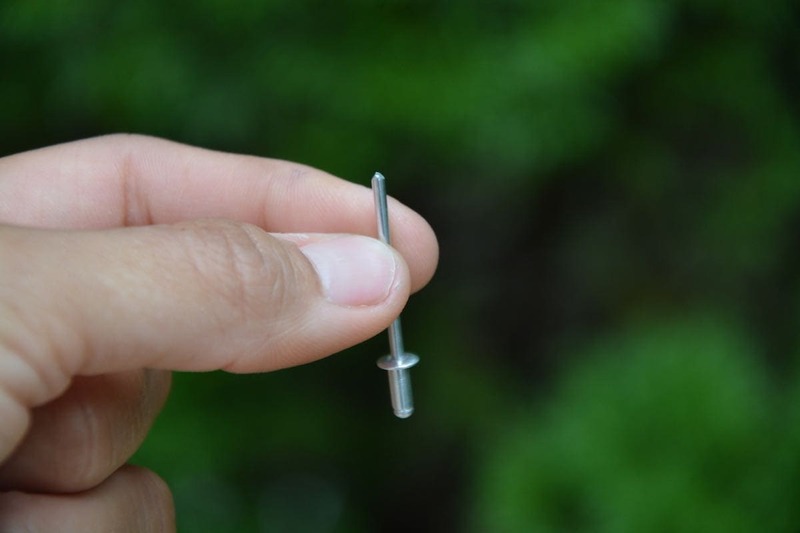 The riveter slides down over the rivet stem and, when squeezed, breaks off the long stem, leaving only the rivet in place, holding the metal neatly in place. Something about these edges intrigued me. 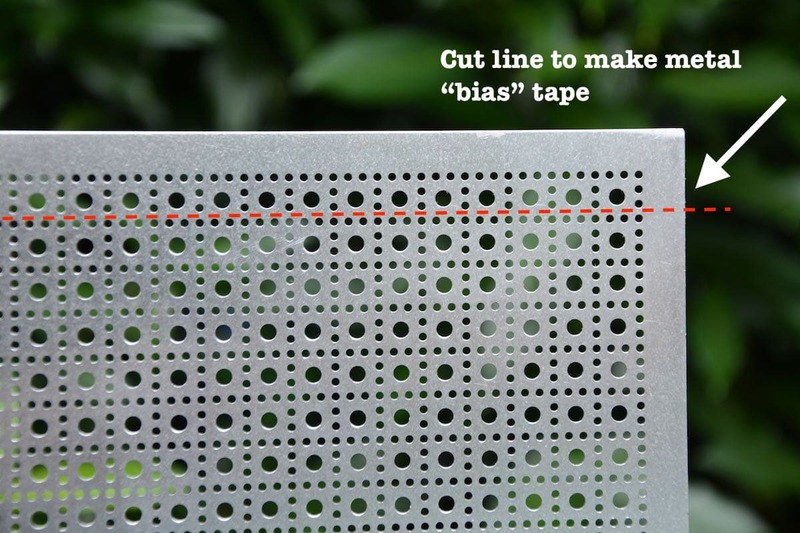 So instead of just cutting out the metal garden planter and leaving the rest of the metal discarded, I decided to cut right where you see the dotted line in order to make metal “bias” tape. For those of you who don’t sew, you may not know what in the heck I’m talking about. Let me explain. Bias tape in the sewing world is a folded piece of fabric that’s sewed on to cover up a raw edge. It makes raw edges look finished. 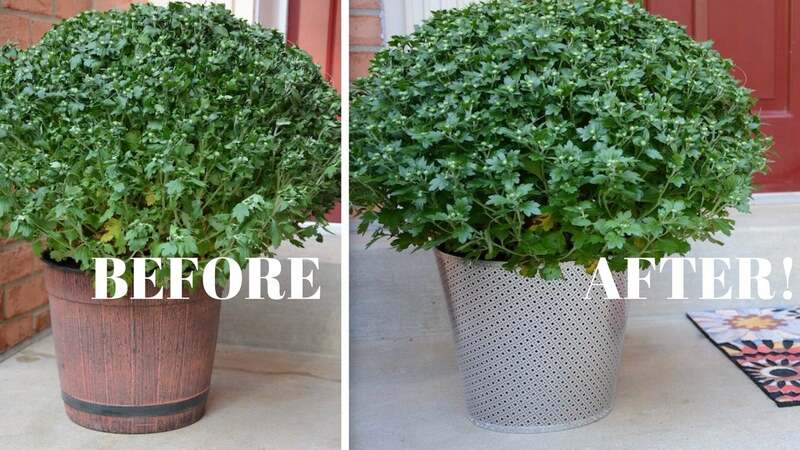 So that’s what I decided to do with this metal garden planter. In order to bend it, I laid this piece on the edge of a table corner and bent it in half. When the metal bias tape was folded in half, I could cover the raw top and bottom edge so it was more decorative and wasn’t quite as sharp. Plus, the extra metal helps to reinforce the top and bottom edges. 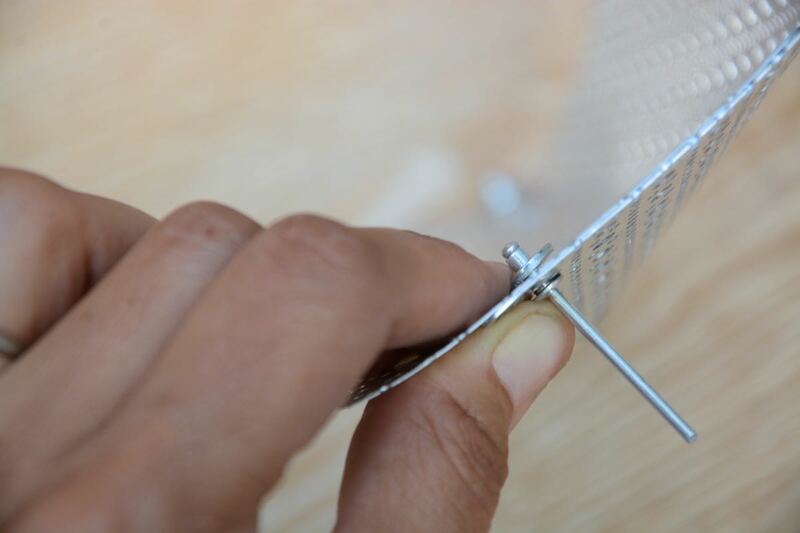 In order to attach the metal bias, I had to drill 1/8″ holes to insert the rivets. As you can see here, the holes didn’t necessarily line up when folded on to each other. 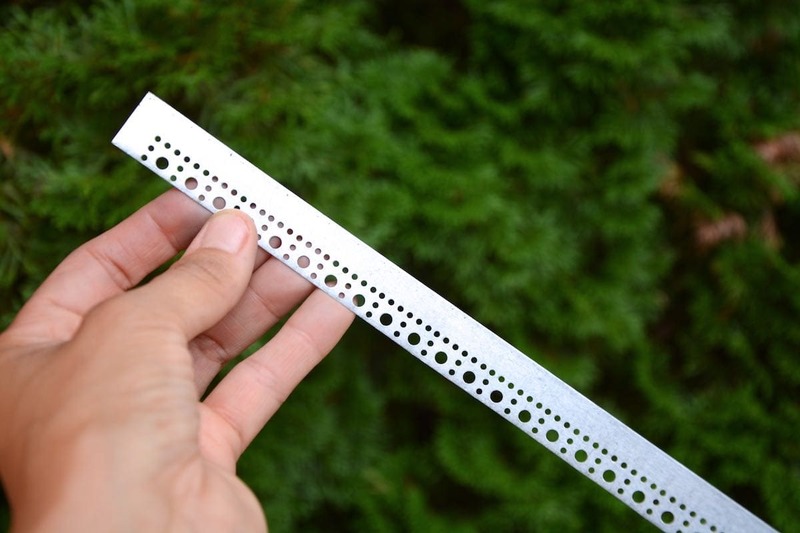 But it was super easy to drill through to create lined up 1/8″ holes for the rivets. I inserted the rivet along with a rivet washer on the back, spacing the rivets out every 6-8 inches to hold the bias onto the metal garden planter. 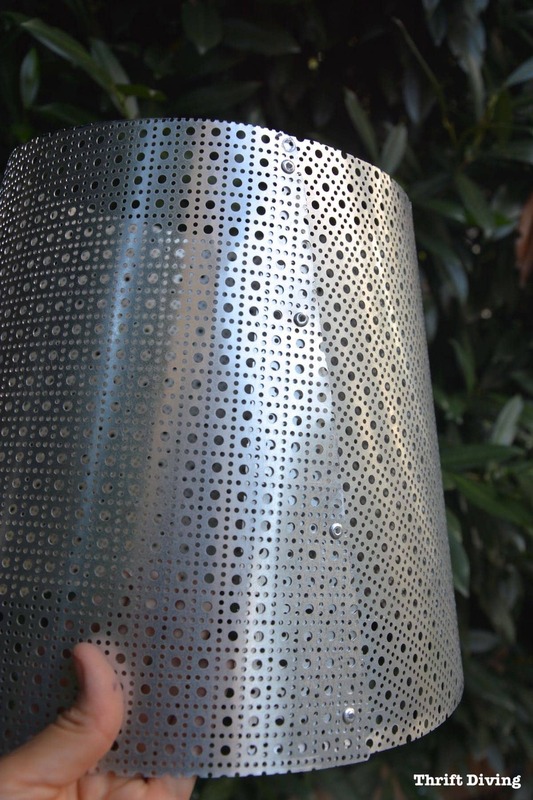 And when turned upside down, as I was working it, they also looked like decorative metal lampshades! HMMMMM………Getting some ideas…. 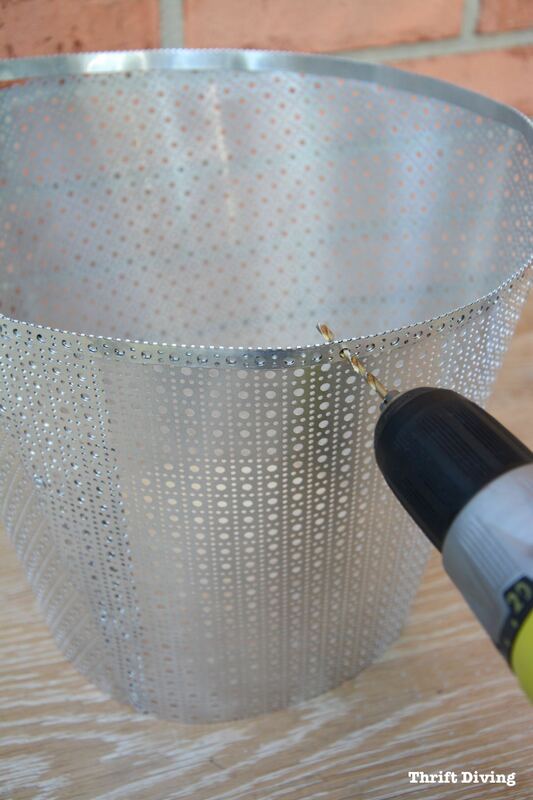 Maybe get some thrifted lamps and make your own metal lampshades? 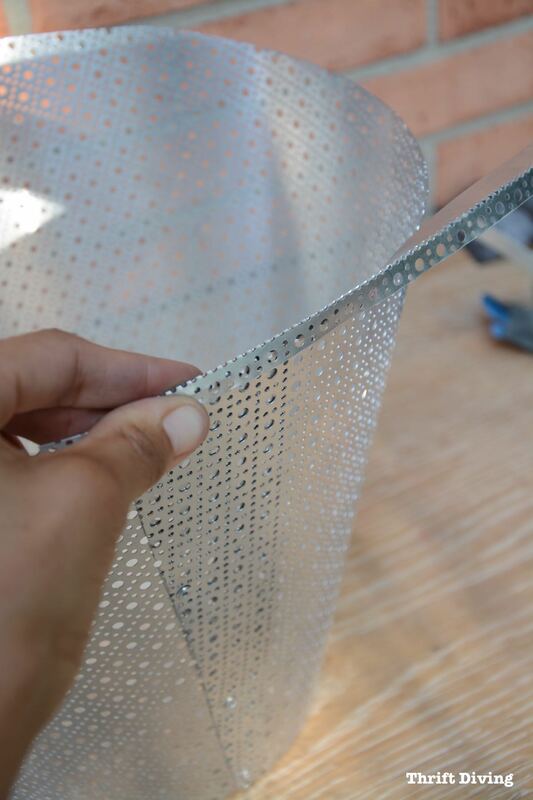 And what’s even cooler is that you can get several different sheets of aluminum metal sheets and mix and match it. I’ve only seen these lincane aluminum sheets in silver, black, and bronze. But if you want a little variety, you can do the bias in another color! Arrow Fastener rivets only come in steel and aluminum but you could very well spray paint the metal and rivets to be any color you’d like. So you’re not limited to these colors. This was the moment of truth! But thankfully, it turned out great! Kojo wanted to help me set them in front of the house. Once I get the front of the house pressure washed and cleaned up, I may go back and do some stenciling on them with “WELCOME” or “HELLO” or something simple. Or, I may make more with the bronze aluminum sheet metal and then spray paint pumpkins on them for the fall! I only wish my garden mums had bloomed in time for this post, but they’re super tightly closed. 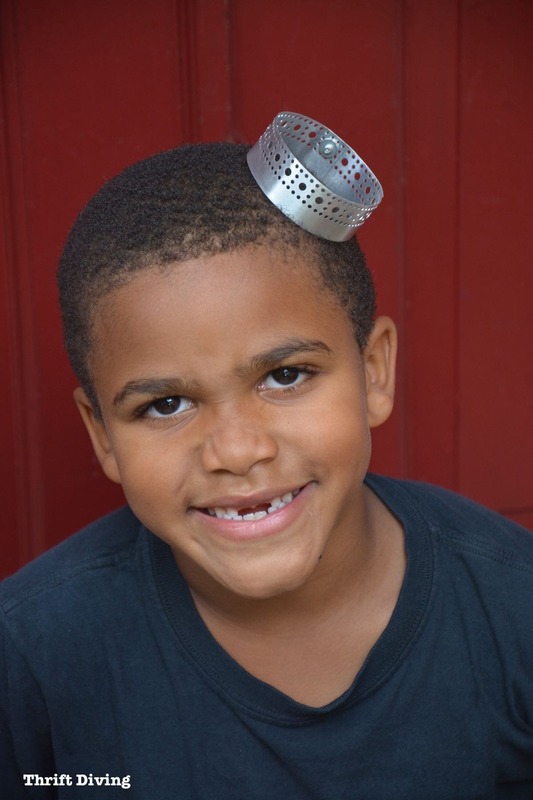 Kojo has a little fun with the metal and rivets, too. Some of my earlier test pieces looked like bracelets and, according to Kojo, crowns. 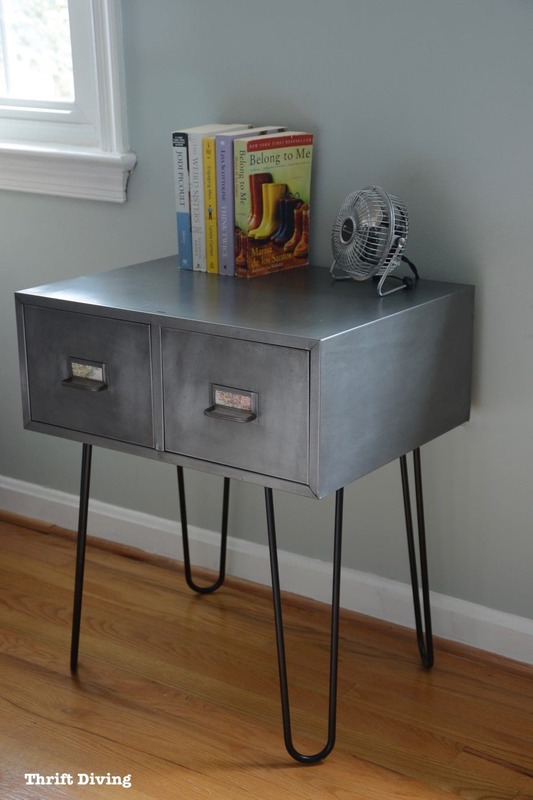 You might also love this vintage metal cabinet makeover. I love these planters! And I love that I can use them indoors or outdoors (the aluminum is rust-resistant). Anyhow, the next thing on my To Do list is to pressure wash my porch, maybe make a fall wreath (even though I have never made a wreath), and to touch-up the front door paint since it’s been a few years since I painted it red. So what about you guys? 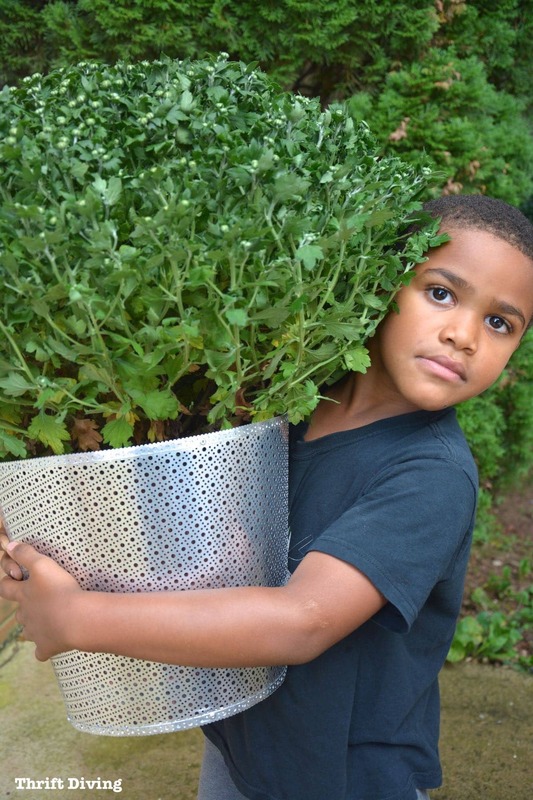 Have you ever made garden pots or garden planters? What about metal ones? Leave a comment below and let’s talk about it! 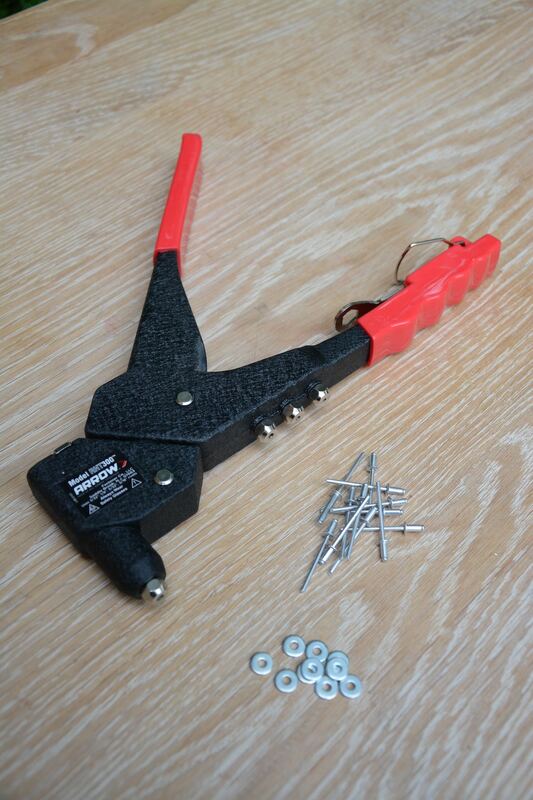 Plus, be sure to check out Arrow Fastener for more info on the cool riveter I used for this project! Thanks, Michelle!! I love these planters. I discovered that I can put smaller (but fuller) plants in them even if the planter isn’t very big. They do well at disguising the planters. Glad you like them! Hey Serena! This looks amazing! As I was looking at your tutorial a light bulb was turned on – have you considered making a tree skirt collar? If you either extend the pattern or cut two and connect them I think that would be fabulous! Just an idea! This project is so stinkin’ creative! I’m loving your metal bias tape. As soon as I saw the picture I had to see how you covered up the raw edges of the metal. I have some of this at home and can’t wait to try it out! Pinned! The small rings you made practicing would be great napkin rings. These are so cute! What a great idea!!! Those turned out great. I always admire those sheets of metal at home depot! so many possibilities. Clever! And very attractive! You have the best imagination and I love the things you come up with. And those would be so easy to add decorations to so you could change them out during the year. Hey, you could even make a really special Christmas Tree holder using that stuff! Lovin’ it! Wow, awesome transformation! Great product. Will have to look into it. Visiting from Show + Tell. Thumbs up, Serena! Those covers look wonderful.